There are 37 Assisted Living Facilities in the Germantown area, with 5 in Germantown and 32 nearby. The average cost of assisted living in Germantown is $4,091 per month. This is higher than the national median of $3,346. Cheaper nearby regions include Collierville with an average starting cost of $3,900. To help you with your search, browse the 277 reviews below for assisted living facilities in Germantown. On average, consumers rate assisted living in Germantown 4.5 out of 5 stars. Better rated regions include Collierville with an average rating of 4.6 out of 5 stars. Located just outside Memphis, the bustling suburb of Germantown offers history, tradition and a beautifully cultivated parks system that’s earned the city recognition from the National Arbor Day Foundation 23 years in a row. Approximately 19.2 percent of Germantown’s population of 39,141 is 65 years of age or older, and those residents have plenty of options for assisted living thanks to a lengthy list of 35 facilities in and around the city. Assisted care living facilities (ACLF) in Tennessee are licensed and regulated by the Tennessee Department of Health under the direction of the Board for Licensing Health Care Facilities. Seniors looking to adhere to a budget will find Germantown to be a less costly alternative to some similarly sized U.S. Overall cost of living in Germantown is slightly above the national average, with grocery, health, utilities and transportation all rated as more affordable. Summers in Germantown reach a sticky 91 degrees Fahrenheit with very snowy winters and temperatures dipping to 30 degrees Fahrenheit in January, creating a climate that’s ideal for seniors who prefer heat over snow. There are of opportunities to soak up culture in and around Germantown, including the active horse show and competition scene that culminates in the annual Germantown Charity Horse Show, the Memphis Brooks Museum of Art and the historic blues venues on Beale Street. Crime in Germantown is far below the national average, making this city a very safe place for seniors and their families to live and visit. The Germantown area is home to world-class medical facilities, including Methodist Le Bonheur Germantown Hospital and Baptist Memorial Rehabilitation Hospital, in the event of medical emergencies or illness. Germantown has an array of community resources for seniors, including the German Senior Citizens Advisory Commission, an organization that makes recommendations to the Board of Mayor and Aldermen regarding the needs of local seniors, and dozens of senior centers throughout the greater Memphis metropolitan area. Assisted Living costs in Germantown start around $4,091 per month on average, while the nationwide average cost of assisted living is $4,000 per month, according to the latest figures from Genworth’s Cost of Care Survey. 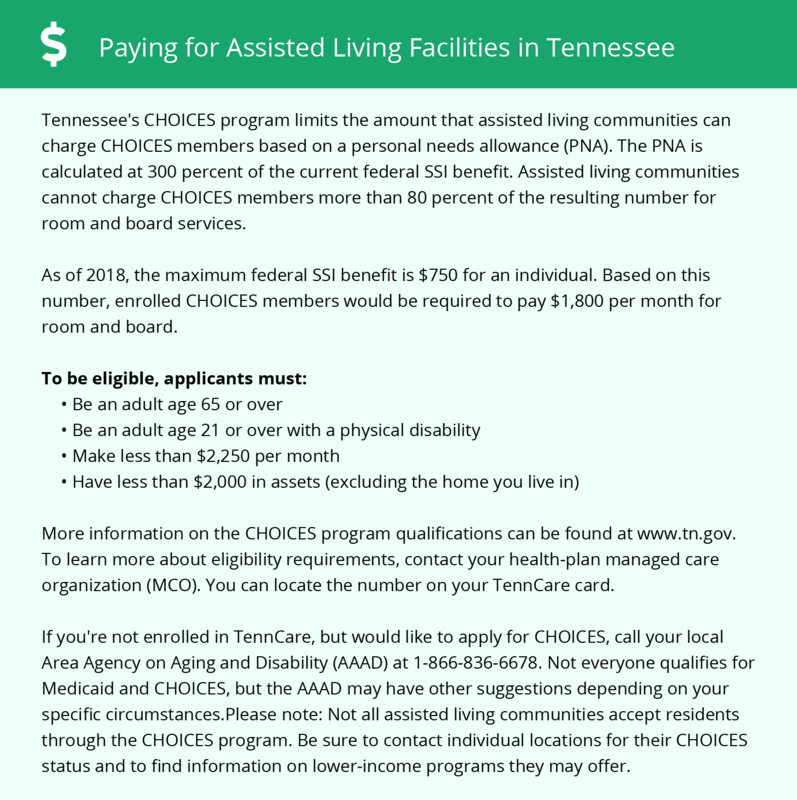 Although Tennessee doesn’t have any state-specific programs aimed at helping seniors afford long-term residential care, there is a Medicaid-affiliated initiative available to those who qualify. The CHOICES program helps adults with disabilities and low-income seniors find alternatives to nursing home placement by providing access and financial aid to cover Home and Community-Based Services known as HCBS. To see a list of free assisted living resources in Germantown, please visit our Assisted Living in Tennessee page. Germantown-area assisted living communities must adhere to the comprehensive set of state laws and regulations that all assisted living communities in Tennessee are required to follow. Visit our Assisted Living in Tennessee page for more information about these laws.